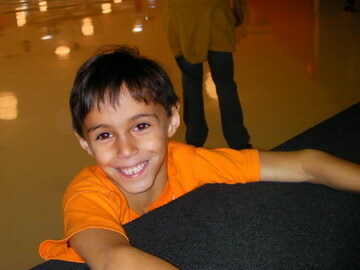 During Christmas break, students at Nicholas's school were given a coupon for a free admission to a roller skating session at Skate City. Nicholas loves skating (meaning roller blades, not ice skating). We both took him on December 30, but Steve, having done skating with Nicholas before, wisely decided to let Nicholas do all the skating and he'd do the watching. It's not that I fall down less than Nicholas does, it's that when I fall, it is farther to the ground, and my weight produces greater momentum. Nicholas just picks himself back up and keeps going. Cathy had skated a lot as a child, and rented some skates to go out with Nicholas. Nicholas lapped his mom several times and after a while, Cathy decided to take a break. Later in the skating session, she decided to look for Nicholas to join him, and just as Nicholas skated by, Cathy slipped and hit her wrist and elbow. It didn't seem that bad at the time, but later in the evening, the swelling and pain became too much of a problem. We went to the emergency room (it was a Friday evening) and Cathy got xrays which showed evidence of a small crack near her elbow. She endured a splint for a week. It is really hard to do things like put on jewelry with just one functional arm, so Steve had to learn things like how to insert an earring into a pierced ear. Gross! Steve decided then and there never to get his ears pierced. It was hard to get good pictures at Skate City because of the lighting. Here's a close-up of Nicholas as he takes a break at the edge of the skating rink. We took some videos of Nicholas skating that actually turned out better than the pictures. When I figure out how to include videos on this website, you'll get to see a 5-10 second clip.